IRVINE, CA – February 20, 2018 – Award-winning digital firm Trinet Internet Solutions, Inc. will be heading to the 2018 National Religious Broadcasters (NRB) International Christian Media Convention in Nashville, TN for the 18th year. Attendees at this year’s NRB Convention will have the opportunity to attend two educational sessions in the Convention Center Learning Arena, both presented by Trinet’s own Chief operation Officer, Ron Weber. The first presentation will be given on Thursday, March 1, at 10:30 a.m. in the Learning Arena. 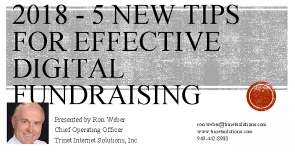 Titled “5 New Tips for Effective Digital Fundraising,” Weber will offer guests new fundraising strategies for their ministries based on best practices from Trinet’s award-winning digital fundraising campaigns. The second presentation in on Friday, March 2, at 2:20 p.m., also in the Learning Arena. 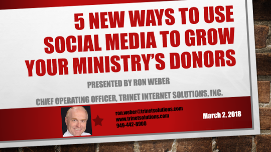 Attendees will have the opportunity to learn about “5 New Ways to Use Social Media to Grow Your Ministry’s’ Donors”, walking away with valuable strategies to increase their online presence to maximize donations. NRB is a nonpartisan international association of committed broadcasters and Christian communicators coming together to spread the life-changing Truth of the Gospel of Jesus Christ through every electronic medium available. Our member outreach touches every continent through Christian radio, television, Internet and other media arts. We hold deeply-rooted beliefs that religious liberty is the cornerstone of a free society, and that we must protect those freedoms so that the transforming reality of Jesus Christ can reach hearts and minds the world over. We provide our members with important resources and effective tools to help them reach their mission goals. NRB also fosters unity among its members, promoting their passion to share knowledge and find solutions to challenges, thereby increasing excellence in their craft. The association protects access to the world’s electronic and digital media, ensuring that the Gospel goes out unimpeded to reach the four corners of the earth. Trinet is a full service award winning interactive digital media firm staffed with 30 full time domestic in-house professionals. 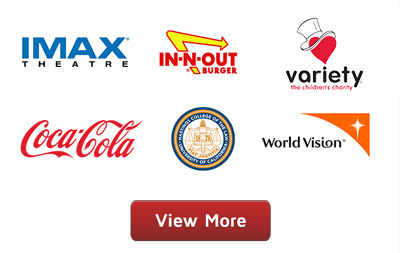 Trinet was founded in 1995 and is headquartered in Irvine, CA with additional locations in Washington, D.C. and Texas. Our values are Christ centered and we specialize in building state of the art digital media experiences, launching highly strategic e-fundraising and digital advertising campaigns. We exceed expectations and generate remarkable results for ministries, churches and para-churches. With 23 years in business, over 1500 award-winning digital projects, and more than 98 industry awards – trust Trinet to take your digital initiatives to the next level. To learn more, please visit www.trinetsolutions.com. Call today and get started 949.442.8900.